Crochet bracelets and earrings (sets)There are 7 products. Crochet bracelets and earrings represented bellow are unique, ooa, handmade Slovenian gift that would surprise any woman who value uniqueness and noticeability of original gifts. Unique crochet bracelets and earrings are very light and simple to wear, soft and gentle on touch, so that this crochet jewelry is definitely going to be something you look forward to wear each day, no matter whether you will be wearing them for special or just casual occasions. This crochet set of jewelry in dark blue is handmade original jewelry for all women who like unique, practical and also timeless gifts. The dark blue crochet jewelry is made of dark blue yarn and wire. Important! Before purchasing this dark blue set of crochet jewelry, please register/log in to Unikatnica. This crochet set of jewelry in black is handmade original jewelry for all women who like unique, timeless and practical gifts. The black crochet jewelry is made of black yarn and wire. Important! Before purchasing this black set of crochet jewelry, please register/log in to Unikatnica. This crochet set of jewelry in green is handmade original jewelry for women who like unique and practical gifts. The green crochet jewelry is made of yarn and wire. Important! 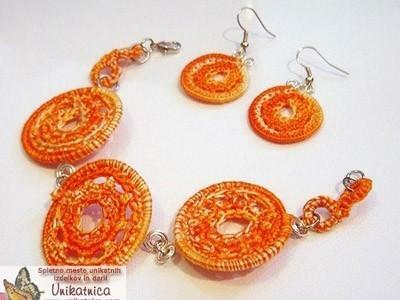 Before purchasing this green set of crochet jewelry, please register/log in to Unikatnica. This crochet set of jewelry in violet is handmade original jewelry for women who like unique and practical gifts. The violet crochet jewelry is made of yarn and wire. Important! Before purchasing this violet set of crochet jewelry, please register/log in to Unikatnica. This crochet set of jewelry in blue is handmade original jewelry for women who like unique and practical gifts. The blue crochet jewelry is made of yarn and wire. Important! Before purchasing this blue set of crochet jewelry, please register/log in to Unikatnica.